Did you capture a great moment on video? We'd love to see it! We're putting together a compilation of funny and emotional clips from live events: private parties, holidays, weddings, graduations, fundraisers, anniversaries - you name it. Make us smile, laugh or cry! We'll accept anything from professionally shot videos to amateur iPhone clips. This is a call for entries to find the best moments captured on video. Any happy or sappy moment! We will pick the best video to feature on the GigMasters YouTube channel. 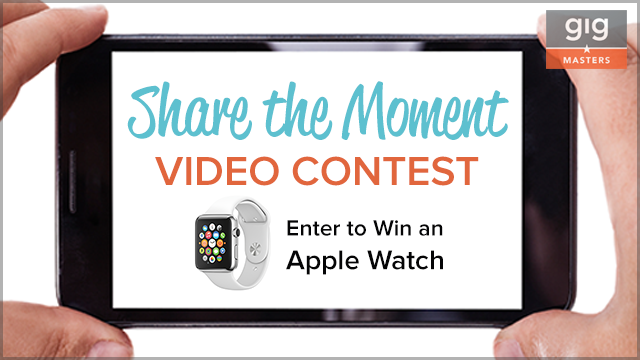 If your video is chosen as the #1 video, you will win an Apple Watch Sport ($349 value). Your video will also be included in a "best moments" video compilation, edited by GigMasters. We will select 4 runner-up entries to be featured on our YouTube Channel. If we pick yours, you'll win a $100 Amazon Gift Card. Your video will also be included in a "best moments" video compilation, edited by GigMasters. The contest will be open until May 31st, 2015. We will announce the winners the first week of June 2015. All prizes will be awarded to the person who submitted the video. Allow us permission to feature your video on GigMasters.com and our YouTube channel. Open to residents of the U.S. and Canada, 18 years of age or older. Option 1: Send us a video link or file to marketing@gigmasters.com with the subject "video contest." Option 2: Comment below with a link to your video on YouTube or other site. Your email address will be hidden on this post, so only GigMasters will see it.